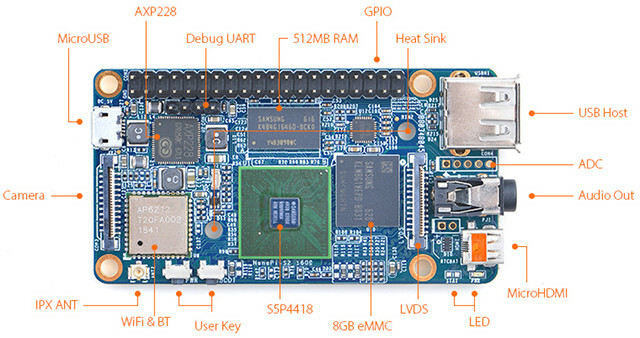 FriendlyARM has released a bunch of Allwinner based NanoPi Allwinner boards recently, but they also have some Samsung/Nexcell S5P ARM Cortex A9 boards in their portfolio, and the latest is NanoPi S2 with Samsung S5P4418 quad core processor, three display interfaces, a camera interface, wireless connectivity through WiFi and Bluetooth 4.0, a 40-pin “Raspberry Pi” header, and more. 40-pin Raspberry compatible header with GPIOs, UART, SPI, I2C, PWM, etc..
Power Supply – 5V/2A via micro USB port; AXP228 PMU with software shutdown and wake-up functions. 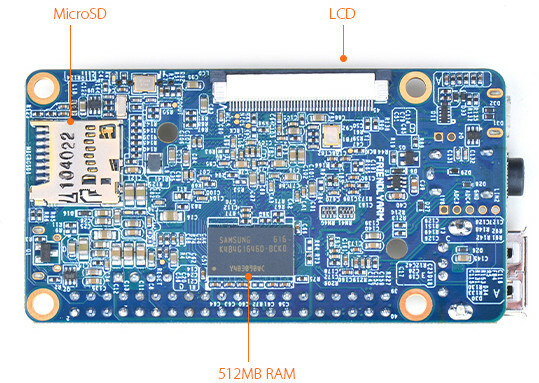 The hardware is quite similar to NanoPi 2 board, but it replaces one of the micro SD slot by an eMMC flash, adds an LVDS connector, an audio jack, an ADC header, and mounting holes with an heatsink. Software support for NanoPi S2 is basically the same as for NanoPi 2 with Android 5.1 and Debian 8 images provided, both relying on Linux 3.4. You’ll find hardware and software documentation on the Wiki. Regarding heatsink: Mounting hole distances of both S2 and M3 are identical (34x58mm) and placement of critical onboard components like headers is chosen wisely so http://www.friendlyarm.com/index.php?route=product/product&path=82&product_id=133 should fit. It should also be noted that currently AFAIK the wrong camera is listed as accessory (CAM500A but it should be the new CAM500B instead I believe). I can’t find any spec in the Wiki for the 5-pin ADC interface. Does anyone know more about this interface or what ADC resolution is available ? It’s small buttons you can program in software to do what you want them to do. Odd thought but if they could go main stream with a Android TV box based on component parts they use would that not drive costs down all round? Just wish they’d use slightly better RF Module sets. I read the other day that many chinese manufacturers use a logo similar but different from the official CE markings and it merely means “China Export”… the style of the logo is clearly intended to confuse, but in theory if you know what to look for you’d spot it’s not the CE marking you actually want. However, there are other sources which say otherwise.. It seems that the kernel version still/always the 3.4.X, which is really old now. The heat sink for T2/T3 works for S2 too.